You can create a group that includes external users, called an external group. You must create the group as an external group - you can't change an existing internal group to be an external group. The group admin can add external users to the group. In public external groups, other users in the group can suggest that adding an external user, but the group admin has control over whether that user is added, and has to approve the addition of the external member. In private external groups, only the admin can add external members. External groups look different than internal Yammer groups, so you can easily distinguish which groups have external participants. The group header for an external group shows that additional networks are participating in the group. External groups are marked with a globe icon in the left navigation. Users invited to participate in an external group hosted on a different network are required to accept the invitation before being able to view any content in the group. When you create a group, you can decide if it is an internal or external group. You can't change this setting after you create the group. 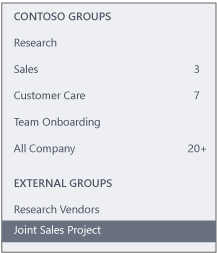 In Yammer, under the list of groups, select Create Group. Type a name in the Group Name box. Type the names of people to add to the group in the Group Members box. Choose who can view conversations and post messages. For a public group, select Approved members from other networks and anyone in this network. For a private group, select Only group members. You can find external groups in your network the same way you find external users. For more information, see Find external messaging participants in a Yammer network. Q: Why don't I see an option for creating an external group? A: If your administrator opted out of allowing external messaging, you won't be able to create external groups. Q: Can I create an external group on an external network? A: No. The creation of external groups is limited to canonical networks and is not available on external networks. Q: Are there differences in working with messages in external groups? A: Yes. In external groups, you can't edit or move messages, or add a topic or a bookmark.